The Armenian Genocide 100th Anniversary Planning Commission held its 4th meeting today at Karen Demirchyan Sports and Concerts Complex. The meeting was chaired by Commission chairman, Armenian President Serzh Sargsyan. “I would like to inform you that I have sent invitations to leaders of a number of states to visit Armenia in 2015 and specifically on April 24 to pay tribute to the 1.5 million innocent victims of the Armenian Genocide together with us, to raise their voice against the crime of genocide and to record that the Armenian people not only survived this ordeal, but also took the path of revival. We not only survived, but also managed to unite and pave the way towards independent statehood – free Armenia. “Ankara continues to speak about the necessity of setting up a commission of historians and opening the archives. First of all, it is known that Armenian archives have always been open to all researchers who were interested in the scientific aspect of the issue. Materials kept at scientific institutions and museums have also been open. But the point is that no archive work is needed for confronting the truth of the Armenian Genocide. “Suffice it to enter any Armenian house or family and testimonies will fill the heart of any listener. Suffice it to visit Tsitsernakaberd on April 24 and see the meaning of that day for every Armenian – both in Armenia and Diaspora. Suffice it to go to any community in the Diaspora and ask how their ancestors appeared there. If the Turkish authorities are interested in the truth, they should come to Armenia and be near the Armenian people on April 24. I don’t think they will be able to speak about opening archives after that. Taking the occasion, I officially invite the next Turkish President – whoever is elected during the upcoming elections – to visit Armenia on April 24, 2015 and confront the clear historical evidence of the Armenian Genocide. FRENCH AMBASSADOR SAYS HOLLANDE'S RECENT VISIT TO ARMENIA "VERY SUCCESSFUL"
economic cooperation between the two countries. of bilateral trade," he added. really interested in the historical truth. progress to date, so the centennial is an opportunity for both sides. a certain progress in the relations," he noted. to participate in canonization of the Armenian Genocide victims,"
during John Paul II's visit to Armenia. ISTANBUL — Armenian President Serzh Sargsyan recently created a stir when he invited the next president of Turkey, who will be elected in the upcoming August presidential elections, to the 100th Commemorative Ceremony of the alleged Armenian Genocide planned to take place in Armenia next year. Expressing at the commemoration committee meeting that Turkey has taken unprecedented steps toward reconciliation with Armenia, Sargsyan also stated that Turkey has continued its "100-year-old policy of denial." "I officially invite the president of Turkey to Armenia to face the compelling evidence of the Armenian Genocide on April 25, 2015," said the president, who received a wide range of criticism from Turkish media outlets which called his invitation arrogant and impertinent. Prime Minister Recep Tayyip Erdoğan at a speech last month expressed his condolences to the grandchildren of Armenians who were killed at the beginning of the 20th century. The Armenian diaspora, along with Armenia, have called on Turkey to recognize the death of 1.5 million people due to the forced emigration policy of Armenians who lived in Turkey during the later years of the Ottoman Empire as "genocide," while Turkey claims 300,00 to 500,000 Armenians were killed along with Turkish people. I believe the Armenian President scored a big one against Erdogan. Thomas De Waal, expert at Carnegie Institute, has commented on the invitation made by the President of Armenia to the President of Turkey to visit Armenia in 2015. “I think this is a clever and positive move from the Armenian government, inviting the Turkish authorities to be part of the Genocide centennial, rather than outside it. It follows a clever and positive move from prime minister Erdogan when he offered condolences to the Armenian people—even if he did not make a full apology,” De Waal told Panorama.am. De Waal does not expect that either side will change its position on the Genocide and 1915; neither does he expect that the Turkish president will accept the invitation. “But at least we are seeing a competition in positive gestures, rather than a competition in negative statements,” he added. Sargsyan's move as a heavy blow to the Turkish poltical elite. think the Turkish side does have an occasion for long considerations,"
circles having made re-evaluations in connection with the 1915 events. veil of good will," he said. re-affirm the proven fact that what happened in 1915 really genocide. expect him to be in Armenia in 2015.
representative of the Armenian Revolutionary Federation-Dashnaksutyun. head of the party's International Secretariat in Yerevan, told Tert.am. expected such a response by Armenia. 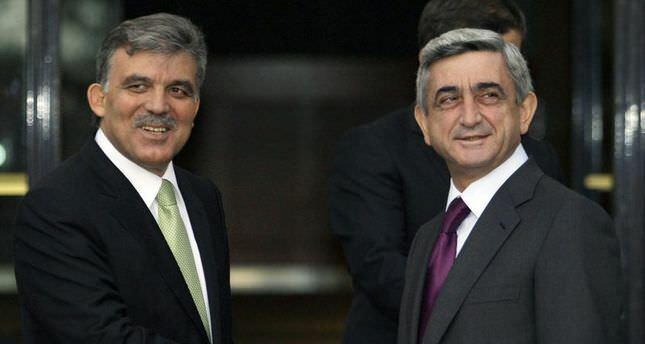 Turkish President Recep Tayyip Erdogan has invited Armenian President Serzh Sargsyan to ceremonies marking the centenary of the Battle of Gallipoli in Canakkale in late April, the Hurriyet Daily News reported. With plans to hold massive ceremonies to mark the centenary of the Battle of Gallipoli on April 23 and 24, Erdogan has sent out invitations to the leaders of 102 countries, including Armenian President Sargsyan and U.S. President Barack Obama. The Turkish government is set to organize ceremonies with the participation of 8,500 Australians and 2,000 New Zealanders. The U.K.’s Prince Charles and his two sons, and the prime ministers of Australia and New Zealand, are expected to take part in commemorations. Speaking to daily Hurriyet, a government official recalled that along with the many other ethnic groups who fought in the ranks of the Ottoman military, the Armenians also fought at Gallipoli. “We fought together in Gallipoli. That’s why we have extended the invitation to Sargsyan as well,” the official added. Armenia says go f*ck yourself! Armenian President Serzh Sargsyan responded to Turkish Prime-Minister Recep Tayyip Erdogan’s invitation to visit Centennial commemoration event dedicated to the Battle of Gallipoli in Turkey, reminding his earlier invitation to visit Yerevan on the same day – April 24 – when the Armenians of the world together with the international community will be marking the Centennial of the Armenian Genocide. “Leaving aside the well-known meaning of the Battle of Gallipoli or the controversial role of Turkey in two world wars, one must recall that peace and friendship first and foremost should be based on the courage to confront the past, on the historical justice, as well as on recognition of full-fledged universal memory and not selective approach”, - reads the response, as published by the Press office of the Armenian President. “I would advise to remember and include in your calls of international peace also a message to the world to recognize the Armenian Genocide and mark the memory of its one-and-a-half million victims. It is duty of each of us to deliver the real and undistorted history to the next generations, thus preventing the repetition of massacres and building grounds for the rapprochement and further cooperation among nations, especially those that are neighbors”, - President Sargsyan wrote. with the Armenian Remembrance Day, the Hurriyet Daily News reports. President Sargsyan and U.S. President Barack Obama. Australia and New Zealand, are expected to take part in commemorations. foundation of the Turkish Parliament. Sargsyan as well," the official added. ceremonies marking the 100th anniversary of the Battle of Gallipoli. was self-dedicated to ensuring the defense and security of the Empire. one's own past, historical justice and universal memory. January 1916, after which the allies' operation started on April 25.
the guest without receiving a response to the guest's invitation." TURKOLOGIST VIEWS ERDOGAN'S STEP AS "INSOLENCE"
sending such an invitation is humiliating. I think the MP is being optimistic, because the world is full of hypocrite leaders, who would sell their souls for interests. I hope and wish that I'm proven wrong on that day and the world will send a strong message to the thugs of Turkey by not going. Any leader who goes to Turkey is a morally bankrupt human being. a day marking the centenary of the Gallipoli battle on April 24, 2015. He said world leaders will be invited to attend the events. visit to UK, and even British MPs expressed a very negative attitude,"
said Poghosyan, secretary of Heritage faction. of denial and is not ready to face its own history. implementation of the denial policy," Poghosyan emphasized. countermeasure ahead of the Genocide centennial. commenting on Recep Tayyip Erdogan's surprise move. precede the Genocide centennial commemoration. with the participation of different high-ranking guests," he noted. [events]. Erdogan in this way actually closed the invitation issue." lasted only several months, said Ruben Melkonyan, another Turkologist. events by conducting scientific conferences and issuing memory medals. also fought in the Turkish army then, in 1915." the key message of April 24," he noted. to derail the commemoration of the Armenian Genocide centennial. this year to coincide with the Armenian Genocide Remembrance Day. nothing more than a continuation [of Genocide] through other means. hosted by a guest "without receiving an answer to our invitation". whole world, could fight pan- Turkism. centennial anniversary of the Battle of Gallipoli. the occasion of the 100th anniversary of the Battle of Gallipoli. Yerevan to pay tribute to the memory of the Armenian Genocide victims. Armenia Serzh Sargsyan to the ceremony. claiming millions of innocent lives and aborting destinies. decorated with Ottoman military awards for his loyalty and heroism. among 1.5 million Armenian victims of Genocide. and genocides in Rwanda, Cambodia and Darfur. memory but never on selective approach. while it began on March 18, 1915 and lasted till late January, 1916.
condemnation of the Armenian Genocide. thus paying a tribute to the memory of 1.5 million innocent victims. hosted at the invitee's, without receiving a response to our invitation. For the official Armenian text of the letter, click here. For the official Russian translation of the letter, click here. of Turkey in the Battle of Gallipoli. Turkey - on the centennial of the Genocide. Armenian Diaspora in the international court against Turkey. will be widely covered internationally. international community for such a revision. the centenary of the Armenian Genocide are getting a factual ground. in particular, said in a statement. conflict zone and at the Armenian-Azerbaijani border. genocide victims at the hands of Ottoman Turkey. Armenian genocide on the same day. Canakkale in Turkish -- should be remembered on 24th April. a bloodletting which at the time upset even Turkey's German allies. victims of the social upheavals of the war - has long been discredited. headquarters prior to their deportation and -- in some cases -- execution. after Torossian's death - fought in the Turkish army. 'indecent proposal' towards President Sarkissian... it is rather insulting!" when they refer to the suffering of the Armenians. April 24th is another matter.